Concrete is available from several manufacturers in bagged ready-mix form. Ready-mix concrete consists of Portland cement and aggregates like small pebbles and sand, and you must mix it with water before application. Mixing a 50 lb. bag of concrete requires only a few basic materials. A wheelbarrow is the ideal spot for concrete mixing on a small scale, as it contains all the materials and mess in one spot and makes your mixed concrete mobile around the job site. Put on gloves and eye protection. Pour the bag of ready-mix concrete into the wheelbarrow or onto an alternative mixing surface. Add the appropriate amount of water to the concrete ready-mix. The amount of water required can vary greatly from one brand and type of ready-mix concrete to the next. Follow the instructions on your ready-mix packaging and add the recommended amount of water. Turn the concrete and water over with your shovel until they blend together. Continue mixing until you achieve a thick and pliable consistency. Add more water if the concrete is too dry to be workable. Blend the water and ready-mix thoroughly before adding additional water to avoid over-saturating, which can result in a runny and unworkable consistency. 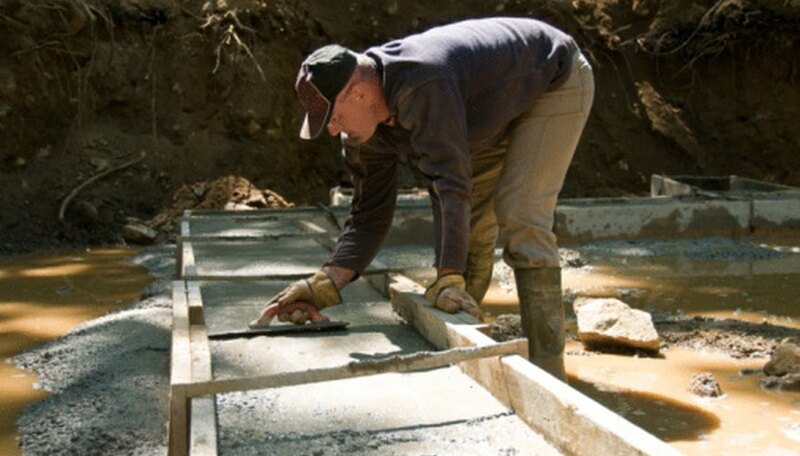 If you do not have access to a wheelbarrow, use a piece of plywood as the base on which to mix your concrete. The water to concrete ratio is key to a proper concrete mix. Add water slowly and keep checking the consistency to avoid over-saturating the mix. Cement dust can be hazardous to your health if inhaled. Wear a protective mask whenever working with dry cement mix. Unmixed concrete and wet concrete contains lime. Lime is a corrosive element that will burn your skin with extensive contact. Wear gloves whenever working with cement. Once the concrete has dried, it is no longer hazardous.